Can I Eat Grapefruit Right Before I Go to Sleep? With its sweet-tart flavor and juicy flesh, grapefruit is a delicious treat that you can eat late at night without feeling guilty. However, this yummy fruit is acidic, and eating grapefruit at night could exacerbate heartburn for some people, which is often worse when lying down. Grapefruit can also interfere with the effectiveness of some medications that you may take before bed, in which case you should choose a different bedtime snack. It's refreshing, it's low in calories and it's full of fiber to keep hunger at bay while you snooze. Compared to other less-healthy late-night snacks people often choose, grapefruit is a great choice, especially if you're watching your weight. If you have heartburn however, you may want to steer clear. 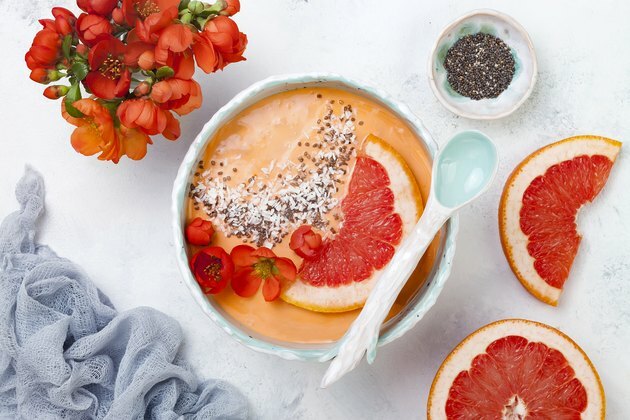 AARP says grapefruit is one of the worst foods you can eat before bed if you suffer from heartburn, and WebMD reports grapefruit is one of the top triggers for heartburn. To make matters worse, many people notice that their heartburn symptoms are worse at night. When you're lying down, food can't clear your esophagus. If you eat grapefruit right before you lie down, that could spell double trouble. In addition, Dr. Robynne Chutkan, founder of the Digestive Center for Wellness in Chevy Chase, Maryland, told WebMD that the effects are more significant on an empty stomach. Depending on when you ate dinner, that may worsen the issue. Not everyone experiences heartburn; plenty of people may be able to eat grapefruit before bed with no problem. If you eat grapefruit before bed and have a problem, you'll know to avoid it in the future. Read more: Can You Eat Anything to Get Rid of Heartburn? Your intestines contain a chemical that is necessary for breaking down medications. Grapefruit juice can interfere with that chemical and stop it from doing its job. When this happens, blood levels of the drug increase and the drug becomes more potent. The risk of overdose also increases. For example, according to a 2013 review in the Canadian Medical Association Journal, the antihypertensive medication felodipine, has an oral bioavailability of only 15 percent. Doctors, therefore, prescribe a dosage level that takes that into account. However, without the intestinal chemical breaking it down, bioavailability could be considerably higher and increase the effects of the drug in a potentially harmful manner. If you're concerned that one of your medications may interact with grapefruit, be sure to ask your doctor before enjoying the fruit before bed, or at any other time of day. Keep in mind that interactions can occur up to three days after you discontinue use of the medication. You might think that eating grapefruit and drinking grapefruit juice before bed are the same thing, but they're not. The juice of the fruit is a concentrated source of sugars. When you drink juice, the sugars are absorbed quickly into your bloodstream, which may lead to a surge of energy — just when you're trying to doze off. Once the sugars are absorbed, your blood sugar falls, often below normal levels. According to University Health News, this can lead to a second burst of energy as your adrenal glands release stress hormones to bring your blood sugar levels back to normal. This rise in stress hormones can increase stress, which can lead to sudden waking in the night. Whole grapefruit contains fiber — 4 grams per fruit — which helps slow the absorption of sugars and keeps blood sugar steady. If you're going to have grapefruit before bed, it's best to eat the fruit whole rather than drink the juice. Read more: What Are the Side Effects of Low Blood Sugar? WebMD: What Could Possibly Be Bad About Grapefruit? Canadian Medical Association Journal: Grapefruit–Medication Interactions: Forbidden Fruit or Avoidable Consequences? Can Drinking Too Much Grapefruit Juice Be Harmful?